We recently had the opportunity to meet animal activist and vegan chef Hillary Watson when she was visiting NYC. 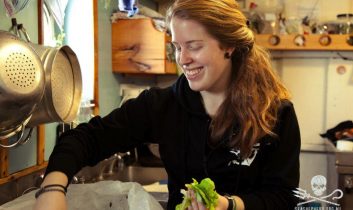 When Hillary – an enchanting Canadian with an undeniable charm and palpable passion for social justice – told us about how she veganized a ship by way of her work in the galley, we knew that hers was a story that needed to be shared far and wide. And so, you’re in for a treat today. Read Hillary’s fascinating story of working as a crew member on a research campaign ship aiming to change the world for animals, and learn how she made an even bigger impact for animals during her time aboard. As a bonus, Hillary is also sharing with us one of her favorite recipes – a Raw Chocolate Ganache Pie that looks like it, too, might be able to change the world, one palate at a time. As a vegan, and as one who enjoys cooking, I am always trying to come up with food ideas that prove to non-vegans and vegans alike that vegan food can look, smell, and taste delicious – and that it need not leave them feeling that anything is missing. 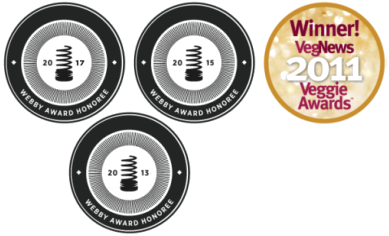 This year, I got the chance to prove just this to a group of people who had never knowingly eaten vegan food before, and I got to prove it to them for two months straight! 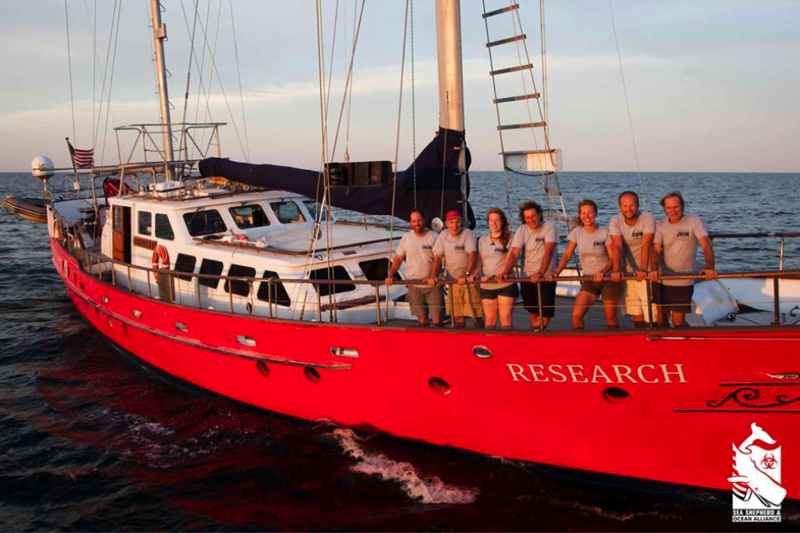 The opportunity came about when I crewed as a cook aboard a sailboat on a two-month research campaign in the Gulf of Mexico. Leading up to this adventure, I had crewed with the Sea Shepherd Conservation Society as a quartermaster on the bridge of the Steve Irwin during the past year’s Antarctic whale defense campaign, Operation Zero Tolerance, and as a deckhand while in port in Melbourne, Australia. During my stay on the Steve Irwin, I had been given the chance to lend a hand in the galley (nautical-speak for the kitchen) from time to time. I love to cook, and it was a treat to be able to prepare some of the food for my shipmates that I would cook for my family and friends at home. After my time on the Steve Irwin came to an end, before I headed back home to Canada, I received an email asking if I would be interested in participating on another campaign out in the Gulf of Mexico. This time, I would be crewing as the vegan cook on the Odyssey for a collaborative campaign between Sea Shepherd and the marine research organization Ocean Alliance. 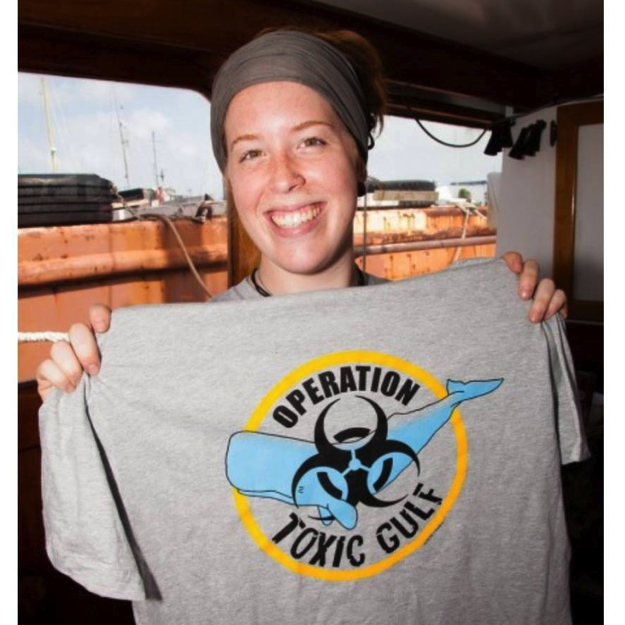 Operation Toxic Gulf would be a research campaign in which we would collect small sperm whale skin biopsies in order to determine whether the whales were accumulating toxins associated with the 2010 BP oil spill. The collaboration between these two organizations presented a unique opportunity. While Sea Shepherd has a cruelty-free policy aboard all of its ships, which means that all food served is vegan, Ocean Alliance does not have the same policy. Thus, if I were to accept this offer, I would be there as the vegan cook to prepare food for the Sea Shepherd crew. Someone else would cook for the other crew members. Upon receiving this email, I immediately had reservations. Although I had experience cooking for others and I had also assisted in the galley on the Steve Irwin, I never before had all of the responsibility of cooking every day for a group of people in a professional setting. Even though I was nervous, I took a deep breath and accepted. Two more weeks of relaxation in New Zealand, followed by a whirlwind of plane rides, and there I was in Key West – ready to begin my next voyage out to sea. As a crew of seven, we left Key West aboard the Odyssey in mid-June. The preparation of the first few meals proved to be a difficult task – two people in one tiny galley cooking two separate meals. It became very clear that something would have to change if we were to maintain our sanity for the next two months. After several ideas were bounced around, I approached the CEO of Ocean Alliance and fellow crew member Iain Kerr and suggested that we change the system of the galley to one meal and one cook at a time. This setup, of course, meant that all members of the crew would have to eat vegan meals for the duration of the campaign in order to accommodate the vegan crew. Happily, it was decided that this would be the most ideal solution, and that from then on, the Odyssey would be a vegan boat! I would be responsible for the meals every other day, and the cook with whom I shared the galley would prepare vegan meals on my days off, during which I would take watches on the bridge and crow’s nest. When the campaign finished, I left the ship and, upon my return home, proudly told all my friends and family how I successfully turned a ship vegan. Yes, it was out of necessity, and perhaps not all crew members continued on eating and living as vegans (though some did! ), but I was proud nonetheless. For those two months, we made a difference. I proved to a group of seafaring people that vegan food is healthy, satisfying, and tasty, and, as a group, we proved to the animals who would have been on some of our plates that we do care and we do not need to eat them. Now, I am home in London, Ontario, and making preparations to head out on my second Antarctic whale defense campaign, Operation Relentless. I will, once again, be filling a position in the galley, and this time I get to prove to myself and to a crew of almost 30 that yes, I can cook, and that vegan food is delicious! This chocolate pie is rich and decadent and very easy to make. It is also gluten- and soy-free. The pie can be prepared 100 percent raw by using raw cocoa powder and no vanilla extract if you’d prefer, but I have chosen to use Camino fair-trade cocoa powder and vanilla extract. This recipe makes one pie. 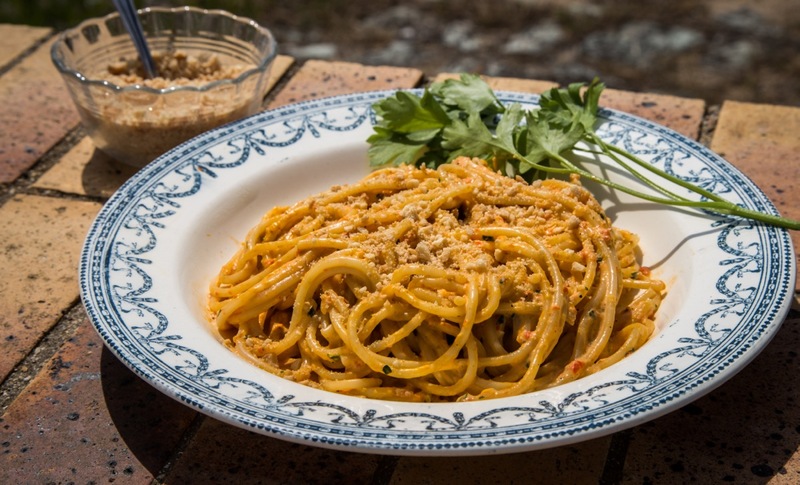 The texture is lovely and the taste is so creamy and delicious, but one piece is usually enough because of how rich it is. Try this recipe in the summertime when you want to keep the house cool, or whenever you don’t want the hassle of baking. For the base: Process walnuts and pecans in a food processor until the consistency is that of course meal. Add the rest of the base ingredients into the food processor and process all together until everything is broken down and you have a course dough-like mixture that will form a ball in your hand. Press firmly into a pie plate until even. Set aside while you make the ganache. For the ganache: Discard water from the soaked cashews and dates. Put all ganache ingredients into the food processor and blend for 1 minute while stopping every now and then to scrape down the sides with a spatula. Check consistency of ganache. You want a creamy, smooth texture with the cashews broken down enough so that there is only a small amount of grit. Process longer if necessary. The longer the cashews soak, the less grit you will get. 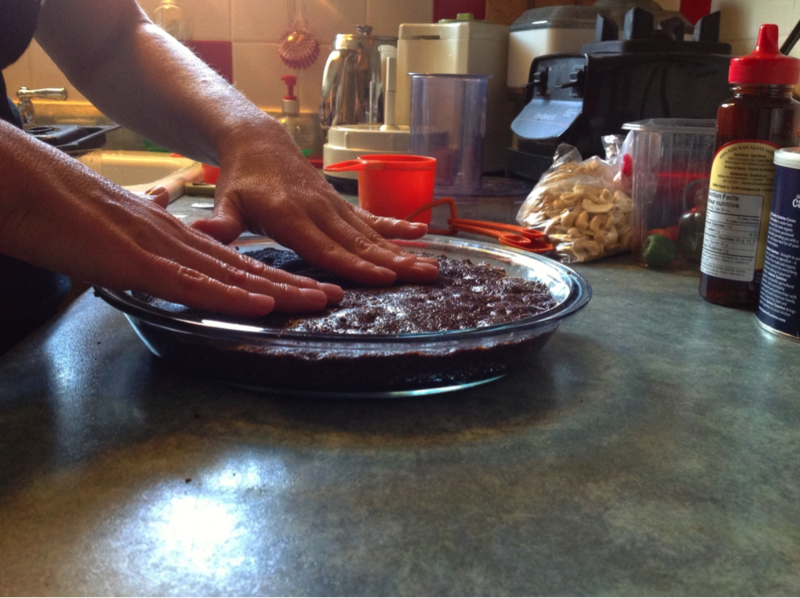 Pour ganache over the base and smooth with a spatula. You can sprinkle coconut flakes or raw cocoa nibs over the ganache if you would like. Place into the fridge to set. 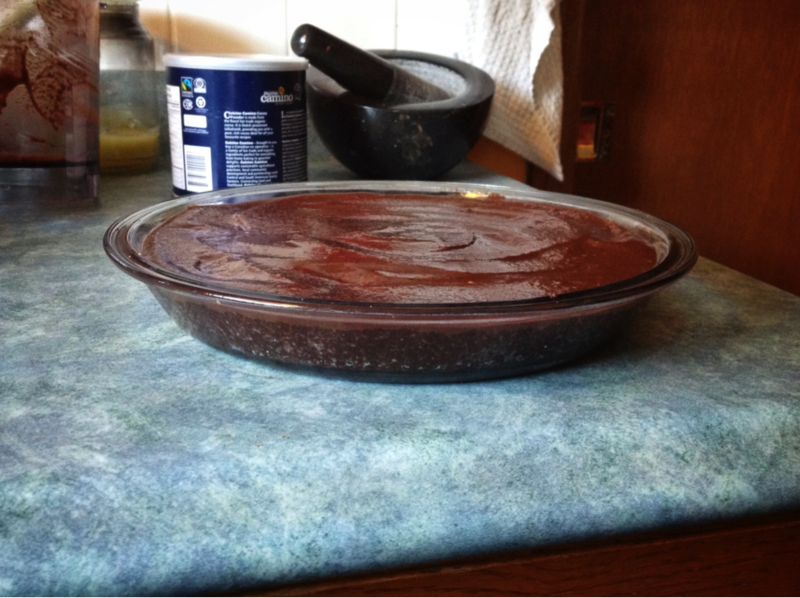 The coconut oil in the ganache will solidify the pie as it chills. 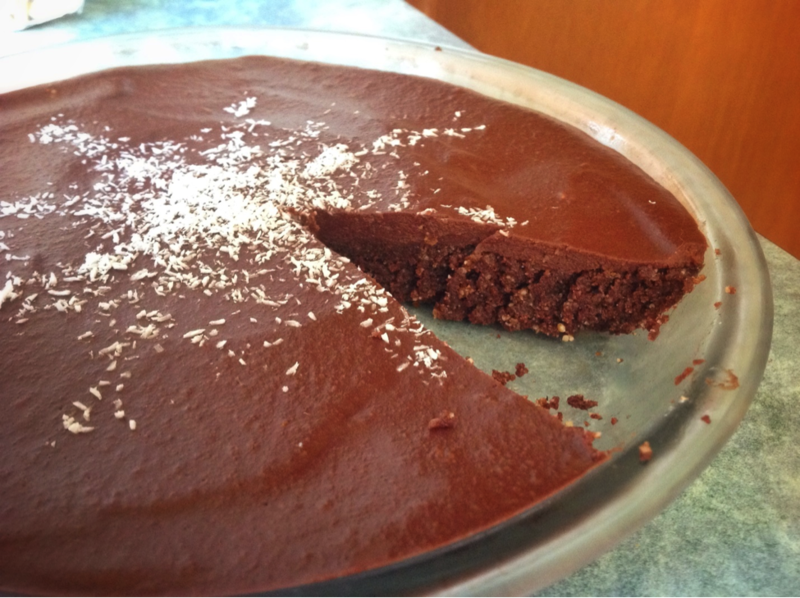 After 1 hour in the fridge, your raw chocolate pie is ready for eating! Hillary Watson is a 23-year-old vegan activist. 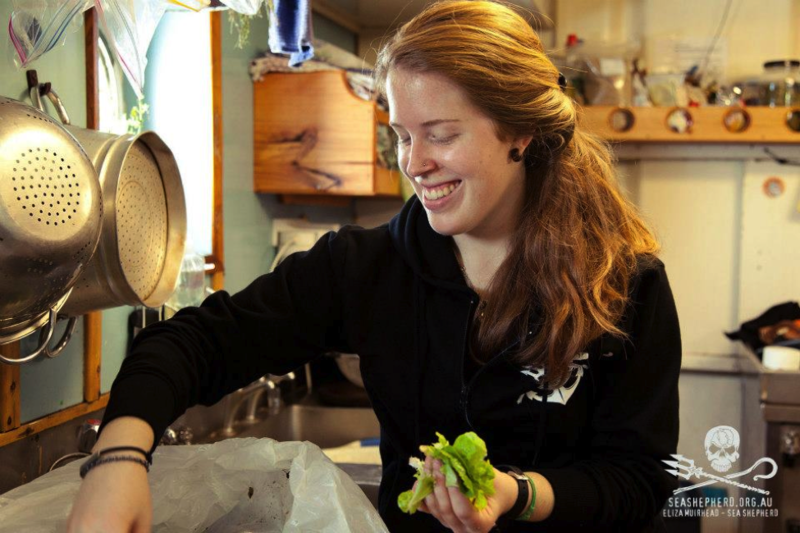 She graduated from college in 2012 with a degree in environmental technology, and has spent time volunteering for Hurricane Katrina relief efforts, Darwin Animal Doctors in the Galapagos, Cedar Row Farm Sanctuary, and the Sea Shepherd Conservation Society. 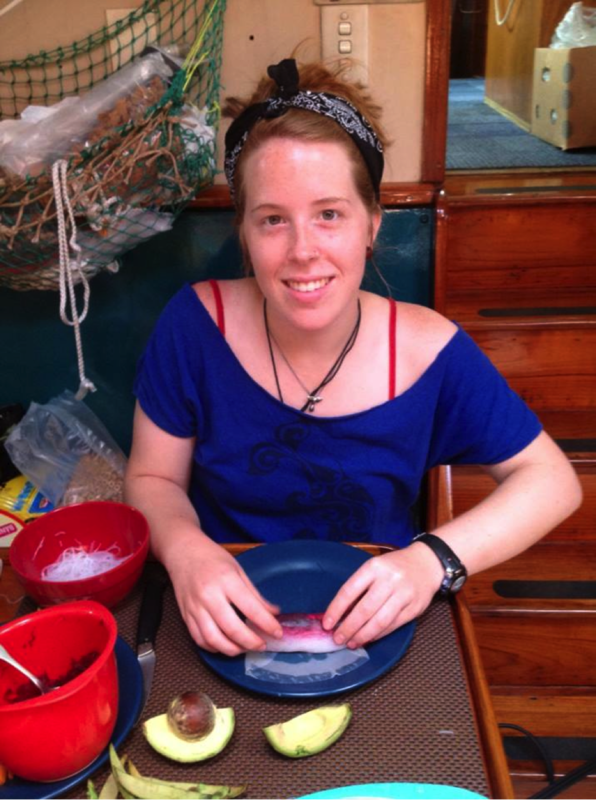 After the sudden and unexpected death of her father in summer 2012, she left her home in London, Ontario, Canada, and set out on a voyage of a lifetime serving as bridge crew with the Sea Shepherd Antarctic whale defense campaign. During the campaign, Hillary was given the opportunity to spread her father’s ashes, which she did along with her father’s brother, Captain Paul Watson (founder of Sea Shepherd). 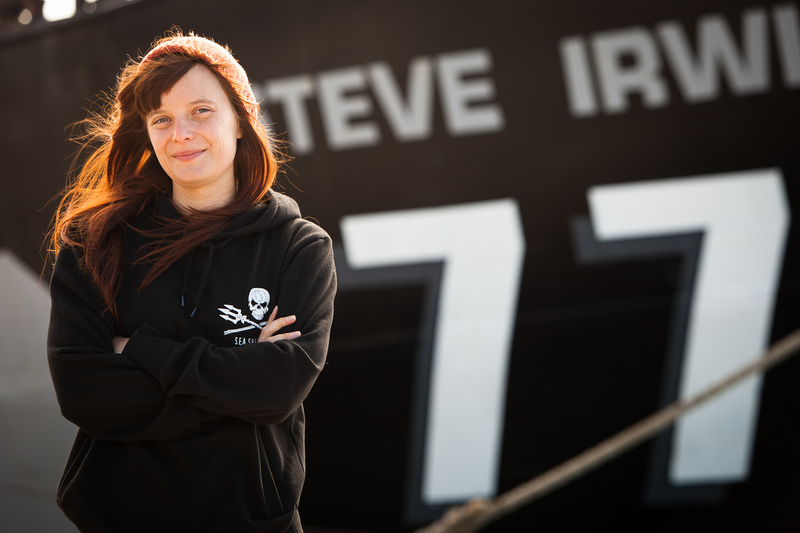 She has also served as galley crew for the Sea Shepherd and Ocean Alliance collaborative campaign Operation Toxic Gulf and is preparing to embark on this year’s Sea Shepherd Antarctic campaign, Operation Relentless, during which she has been asked to crew in the galley.